On February 7, 2019 at approximately 11:45 AM, Oregon State Police (OSP) Troopers responded to a serious injury crash on US Hwy 97 near milepost (MP) 133. OSP has learned the seriously injured driver succumbed to her injuries on February 09, 2019. The preliminary investigation revealed a southbound Ford Edge, driven by Anita Johnson (age 75 from Redmond) was slowing for another vehicle when a 1994 Kenworth tractor- trailer with a semi-trailer, driven by Chelsea Rice (age 28 from Aumsville) loaded with gravel rear ended the Ford Edge. The Ford Edge went off the highway to the right and struck a tree. The Kenwood came to rest partially blocking the slow lane and right shoulder. Johnson sustained life threatening injuries and was transported, by ground ambulance, to St. Charles Hospital in Bend where she died from her injuries on February 9, 2019. Chelsea Rice sustained minor injuries. The highway was diverted to a single lane of travel for both SB and NB traffic for approximately 4 hours. The investigation of the crash is still on-going. 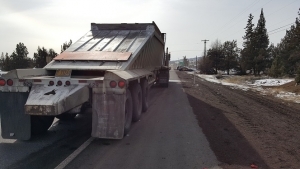 OSP was assisted by Deschutes County Sheriff’s Office, the Deschutes County District Attorney’s Office, Oregon Department of Transportation, and Deschutes County Fire and Rescue.